RVs come with many available feature and options — some that you won’t appreciate unless you already have them. Whether you are looking for a used RV, a new RV, or you are remodeling your current RV, there are certain interior features that will help make your home away from home the best it can be. Many newer RVs are offering free standing tables and chairs in place of the old built in dinette style option. This configuration gives more flexibility in the space. Newer models are also offering a dedicated workspace, which in earlier days was a token desk in the kitchen or bedroom. 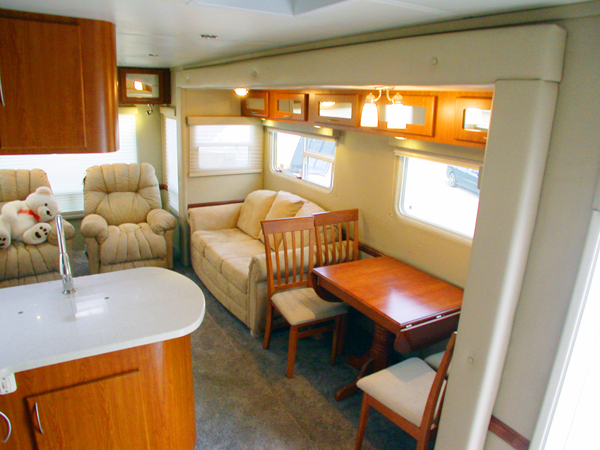 Some RVs now have a mini office incorporated into the living space. If you are adding a desk to your RV, don’t forget to make room for a chair. The bigger the window, better the view! The new trend of larger windows is being recognized by many RV manufacturers. Look for large windows in the living room, and skylights in dark places like the hallway and bathroom. Look for stands or wall mounts with the ability to flex and swivel instead of fixed and inside mounted cabinets for the T.V. The ability to turn and move the T.V. allows for more viewers to see it from multiple angles. 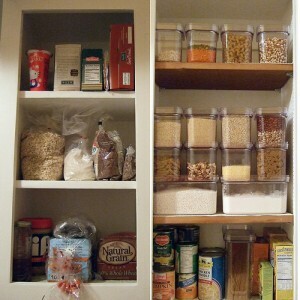 Like you would for a kitchen in any home, the most important thing to look for is storage space. Many RVs have tiny kitchens with very little counter space. The ideal solution to this problem is a drop-down type of counter extension. If your RV doesn’t have one, they are easy to install and can add valuable space. Storage and shelving are also a main priority in the RV kitchen. Look for shelves that are easy to remove for repairing and cleaning. Built in racks for keeping storage jars, and pull out pantries for keeping canned goods are essential parts of the ideal kitchen. Due to heavy traffic present in some small pathways, flooring is one of the main concerns. Even though carpets look really cool and beautiful, they should be restricted to the bedroom and living room only. Laminated plastic, vinyl and linoleum floorings are all great options for kitchens. For ease of use and saving space, look for built-in appliances. Ones that serve multiple purposes like microwave/convection ovens are best. Look for a bed that can be accessed on at least two sides. If you need to get off the bed, climbing over your partner can get tiring after awhile. It also makes it much easier when it comes time to change the sheets. 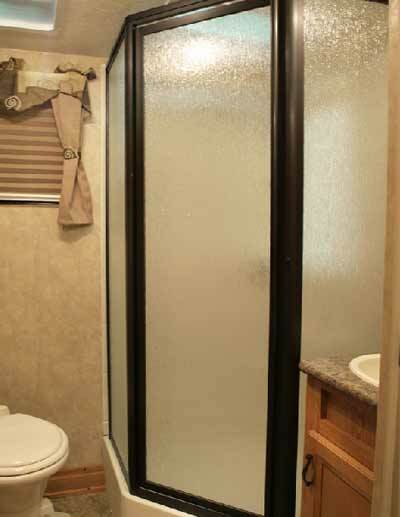 The best way to provide true privacy in RV bathroom and bedrooms is with a door. Bedrooms and bathrooms should have locks and solid doors. For Toy Haulers, a good strong door separating the storage space and the living area is a must whether you are hauling a bike, a kayak, or simply using the space as storage. A closet with a large space is a luxury in an RV. But even a small closet can provide lots of space if it is equipped with hanging rods, bins and adjustable shelving. Also look for mirrors on closet doors to reflect the light and make the room look brighter and more spacious. 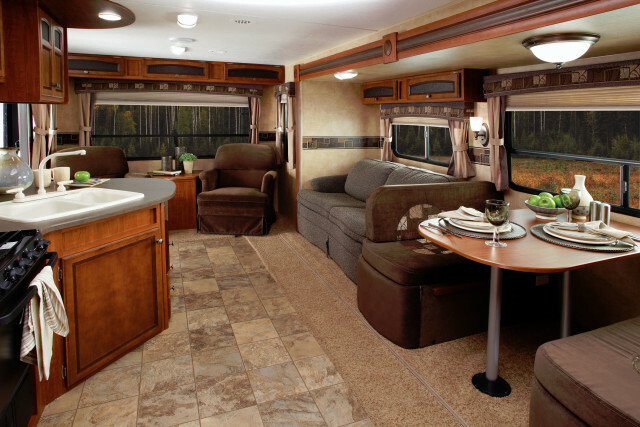 Keep these interior features in mind when buying or renovating your next RV!